We Want Free trade, but what is it? The concept of Free Trade is very simple but it is found nowhere on the planet today and for most of the past as well; and a hard fact is that if a federal government is involved even a little bit you can bet your bottom dollar there is no Free Trade. Free Trade means that ever transaction is a negotiation between the two parties which are the buyer and the seller for a greed to price in some currency for a good or service in a different country. So let’s set up a two country world model country A the USA and country B China. The buyer in country A gets the goods and the seller in country B gets the currency. Where things get sticky is what does the seller do with the currency he gets, dollars in this case, since he can’t spend it in his country? Well you say he takes it to the bank and converts it into the currency the seller uses, Yuan in this case, at some specified exchange rate; but that doesn’t solve the problem it just transfer it to the bank. The bank will hold the dollars for a time as the bank knows that a buyer in the banks country will need the Dollars they are holding to buy something in the USA at some time in the near future. Now so long as the need for Dollars and Yuan are proportionally equal, say one Dollar for one Yuan the trading system is in balance and we have Free Trade; meaning at the end of the year the bank has no dollars or yuan in its trading account. Now we add a complication to the analysis which is what does the bank do if at the end of the year it has a balance of dollars, a surplus, which were not needed? Well since we are still in a Free Trade situation the bank could reduce the exchange rate making the Dollars cheaper vis-a-vis the Yuan say two Dollars for one Yuan which makes the USA goods 50% cheaper. So the demand for dollars goes up and more USA goods are purchase and the system is back in balance. So there is a method to insure that the trade is in fact free; meaning free of government interference i.e. tariffs, customs inspections, fixed exchange rates and various standards and quotas. What the cleaver Asians have figured out, first the Japanese, is that the American politicians are stupid and corrupt and like buying votes with free things to the poor. But to get the money for paying for the free things (someone does have to pay) they would need to tax the rich and since they are the rich that wouldn’t work so well so they needed another way to get the money that they could blame on others, evil companies. In the previous example we had a surplus of Dollars in China being held by the bank and so in this example the Chinese government took the Dollars from the banks at the previous rate of one Dollar per one Yuan so they now had the dollars. Now the cleaver part was that they didn’t buy goods in the USA they bought US Treasuries, basically they were leading their Dollars to the US Government. And our government was glad to get them as it gave them more money to buy free things for the masses. However there was a price this system made it almost impossible for the US companies to compete in China; and worse it made the Chinese goods so cheap that they had to start buying their parts from China. 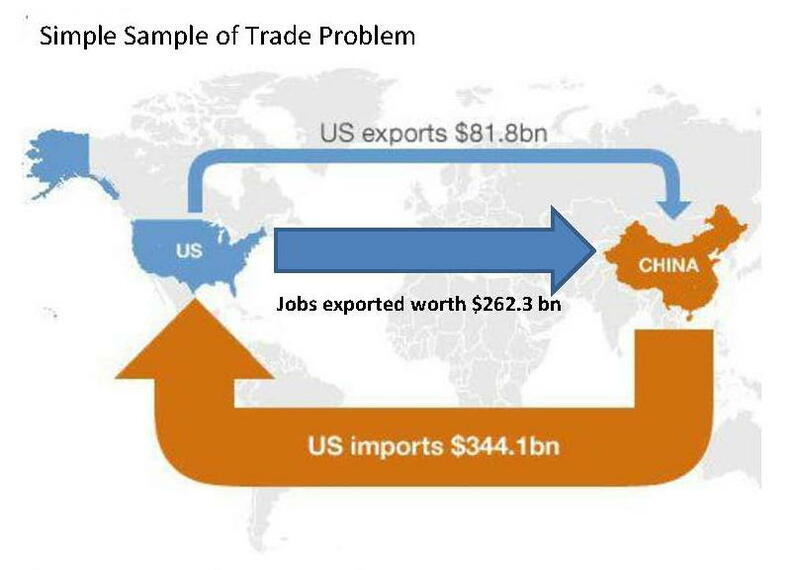 This system is not sustainable as there are only so many jobs that can be shipped to China and at that point they will have trillions of Dollars in their hands and they will end up buying the country with it. We are now in a political a system, not an economic system, where we get cheap goods and in return we ship them our jobs. No sane government would ever do this as it can’t last very long and at some point there is no returning to the old system, and we are almost there. Is climate change real and if so is humankind responsible? The Earth gets all its energy from the sun in a somewhat complicated process of absorption and radiation with delays between the incoming and outgoing energy that creates a livable temperature on the planet’s surface. Geological records, going back hundreds of millions of years, have shown that the planet’s average surface temperature has ranged from a low of ~12.0OC to a high of ~22.0OC and the planet is to the low side today at just under 15.0OC. Obviously the mechanism that regulates the planets temperature is self correcting and does not get into a runaway hot or cold scenario. Since we know these facts to be true, we therefore have an inherently stable system. The next fact to be considered, is that 10,000 years ago we were just about ready to come out of the last “Ice Age” with deep glaciers covering most of the land masses in the northern hemisphere. Obviously humankind had nothing to do with the existence and removal of that ice and so again we have proof that the climate is a variable and never gets totally out of line. But it should be kept in mind that we still have not got back to what would be an average geological global temperature of ~17.0OC so panic at the current slightly less than 15.0OC is somewhat irrational. Now looking back two or three thousand years where we have recorded history and physical evidence we find that there have been well documented alternating cold and warm periods; The sub-Atlantic cold period, The Roman warm period, The dark age cold period, The Medieval warm period, The little ice age and the current Modern warm period. These cycles are real and consistently repeat themselves in a ~500 year up or down cycle making for a ~1000 year over all cycle. That movement in global climate is therefore the base for our modern climate and must be used in any climate model that will work. Global temperatures are published each month by NASA-GISS (NASA) in their Land Ocean Temperature Index (LOTI) which goes back to January 1880 and runs by month to the current date and is where we get temperatures to work with. In that data, one can observe both the ~1000 year cycle and also a shorter ~70 year cycle which were used to create a climate model based on those two cycles back in ‘07. 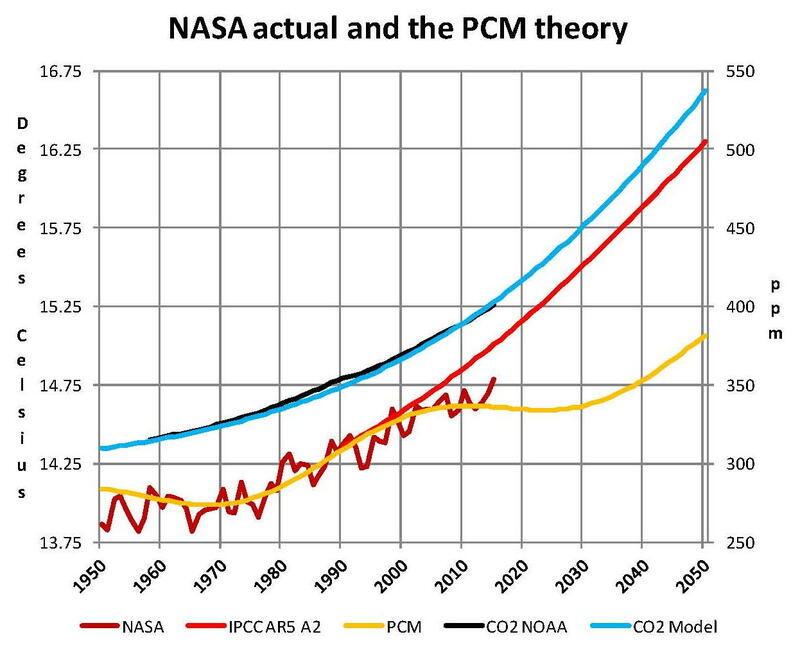 However once that model, which I called the PCM (Pattern Climate Model), was completed it was found that there was another factor to consider which was the effect of increased levels of CO2. The addition of CO2 with a lower sensitivity values than that used by the IPCC, 0.65OC verses 3.0OC, gave excellent predictive values and was used very successful until 2014 since this model predicted the current “pause” and further showed it will last until the mid 2030s. Two things happened in late ’14 and early ’15 the first being that NASA decided to start seriously tampering with the climate data to make sure that the December 2015 COP21 conference in Paris had data that showed the planet had never been this hot before. The anomaly value published in November 2015 for their LOTI table for October 2015 was 104 which is the equivalent to 15.04OC; and sure enough in “that” report October 2015 was the hottest ever recorded by NASA. Unfortunately in previous versions of that report many other months had values higher than 104; so NASA had to make them colder in the November 2015 report. Data tampering was nothing new to NASA but what was done this time was so blatant that just about everyone in the field could see it. This data tampering created a situation where the climate model I developed was now showing an error or deviation that had not previously been observed, although it was not a major deviation and the PCM model was still more accurate than any of the IPCC GCM’s. The other thing that occurred was that I became aware of the use of Pi (3.1416) in finding patterns. During November I decided to see if Pi could be used to improve my model. What I found was very interesting and it did make the climate model better. A base to work from was needed and so I picked the 22 year solar magnetic cycle. Thus 22 times Pi is 69.115 years and that becomes the short cycle and the long cycle becomes 15 times the short cycle or 1036.726 years which made it 330 times Pi. These values were not much different than what I had come up with in ’07 but they did make an improvement in the model being able to match the NASA values even better after changing all the formulas that I used to reflect this change. Also Pi to the power of e is 22.46. With the equations set only three things were required which were a starting date, 1650 in this case, and a starting temperature, 13.4OC, and lastly amplitude for each cycle. Based on observations 1.65OC was used for the long cycle and 0.29OC was used for the short cycle. These values are reasonably consistent with observation. After making this change there was no change required in the CO2 model which is a logistics curve and matches the NOAA plot almost exactly which then allows projecting CO2 in to the future. Then after making all the adjustment based on Pi I found that I had to raise the CO2 sensitivity value up from what I was using 0.65OC to get the plot to match NASA data. I’m not sure this increase is justified as the NASA data is artificially high and so the 0.75OC value that I used may also be too high. However the 0.75OC is close to the expected lower values in current published papers and so even if the NASA values are eventually corrected and lowered, as they must be, a new lower value such as 0.75OC will still work since the sensitivity effect at that level is relatively low. The following chart shows the results of using the 22 year solar magnetic cycle and Pi as the determining factor for the observed climate patterns. This chart is made from the average value of temperature and CO2 for each year, instead of using the monthly values which are very irregular in the NASA temperature tables. You can see the large upward movement in the 2015 temperature which is not justified as the satellite data clearly shows a lower value, however you can also see that the yellow plot from my model is very, very close to a mean of the NASA values. The sad thing is that this model might be even better if we had the real values to work with not the manipulated ones that NASA gives us. I have also added a red trace showing the IPCC AR5 A2 global temperature projection. The next chart shows a complete 1036.7 year cycle. 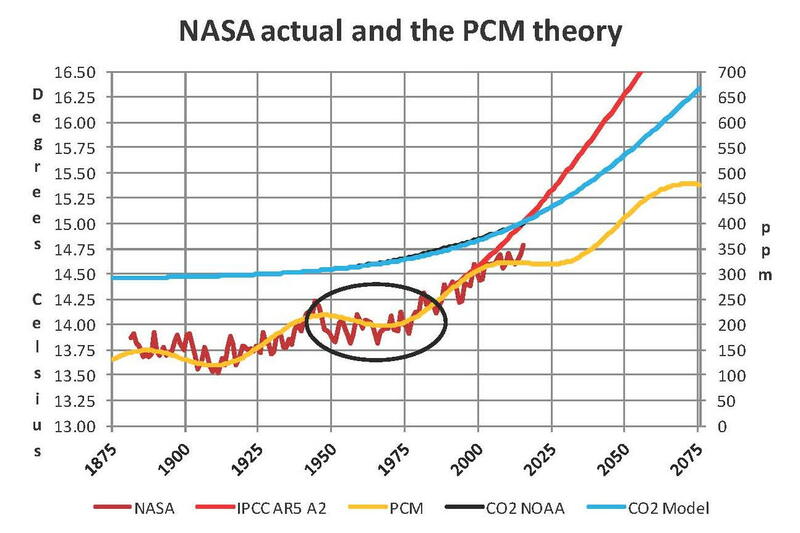 What we have is 1.65OC from the long cycle, 0.29OC from the short cycle and about 1.4OC from CO2, but actually I think the effect from CO2 will be less since the current NASA numbers are inflated and that forces us into a higher level in the model. Personally I think that the total will be close to a half a degree less than shown here but even if not we are still well below the geological average of 17.0OC so there is nothing to worry about. Both CO2 and global temperatures have been significantly higher than present levels which are actually closer to historic lows than to historic highs. Also if CO2 does get do over 1000 ppm plants will grow faster and therefore farming will have higher yields. 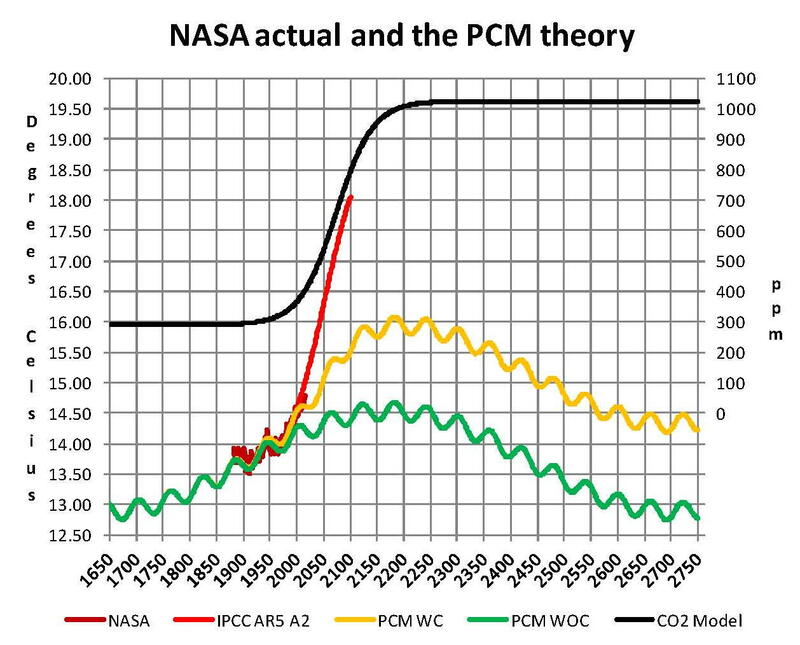 I also added a green plot labeled PCM WOC (without carbon) to this chart showing what the existing pattern of the long and short cycles would be if there was no increase in CO2 from the base of 290 ppm so we have something to reference the effect of CO2 which is only ~1.4OC. Today’s current temperatures would be about .5OC lower with a constant level of CO2 than they are with CO2 going from 290 ppm to 400 ppm. The next big global temperature increase will be from 2035 to 2070 and that will probably be a full degree so if we are not prepared that will cause utter panic since that will be more than what we had from 1975 to 2005. The Chart on the next page shows these items. This climate model has been rightly criticized as curve fitting and I cannot claim it is not; however it does work so it must be based on real processes at play on the planet. My best guess is there are two things going on the main one is the apsidal precession of the earth’s orbit which reverses the aphelion and perihelion to the seasons every ~10,000 years. Since the bulk of the land is in the northern hemisphere and the southern is mostly water this makes a big difference since the summers will get hotter and the winters will get colder in the northern hemisphere when the earth’s axis is pointing toward the sun at perihelion which it will be in 10,000 years. 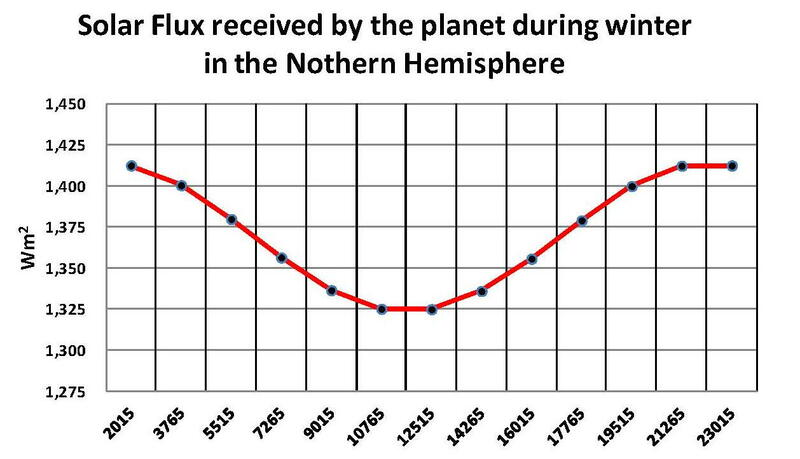 A plot of the changes in solar flux is shown on the next page. know this is not 1,000 years but I just have a feeling that it is related. The thermohaline ocean circulation is a 1,000 cycle and probably related to the precession but this alone cannot explain the global temperatures and so it has been dismissed. The other cycle the short 70 year cycle which is, in my opinion, related to the 22 year solar magnetic cycle which probably has an effect of particles entering the earth’s atmosphere and that changes the cloud layers which changes the planets albedo. There is more support for this theory but by itself it cannot account for the observed changes in global temperatures and so it has also been dismissed. After writing this paper I became aware of a paper published by the National Academy of Sciences (PNAS) November 7, 2000 by Charles A Perry and Kenneth J Hsu. The paper was about a relationship between 2^N and solar output i.e. the solar magnetic cycle of ~22 years. So 2^6 power is 64 and 2^10 is 1024 which is not far off from using PI * 22 or Pi * 330, and in fact substituting those values in my model made little difference in the output. And since the NOAA and NASA published temperatures have been compromised there is no way to know which system is better at matching current temperature, which is very sad of science. When the long and short cycles are removed we are left with only CO2 and that forces us to use the NAS 3.0OC +/- 1.5OC for each doubling of CO2; which worked when the long and short cycle were both in ascendance but 3.0OC +/- 1.5OC does not work now that they are not. As long as we ignore the geological cycles we will never be able to build a GCM that works. 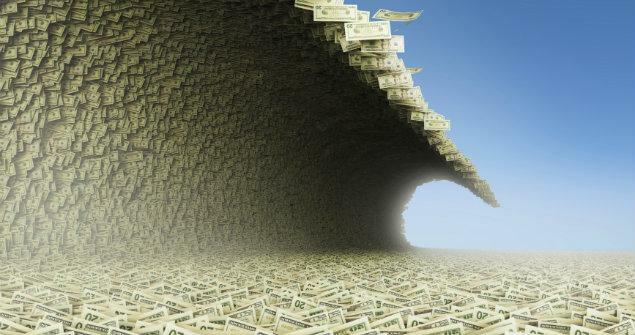 The Federal government never has enough money and over the past decade they have created enough money, Dollars, that there is a title wave of them about to hit us; we need a different system that the politicians can’t subvert. This short post is a way to achieve that. The following figures are taken directly from the following government reports: Bureau of Economic Analysis (BEA) monthly report of the GDP of the United States; Monthly Treasury Statement; the Bureau of Labor Statistics (BLS) monthly employment situation; The Monthly Statement of the Public Debt of the United States and the Department of Defense (DOD) Active Duty Military Strength Report. The Monthly Treasury Statement data is reformatted to calendar year format the government fiscal year format which runs from October to September so we can compare apples to apples. #1 The federal government currently spends almost $4.0 trillion a year ($3.885 trillion) of which some is derived from taxes & fees ($3.096 Trillion) and some is borrowed ($789.5 Billion). More on this subject later since the official GDP figures are different; so we use $3.2 Trillion here instead of the actual $3.9 Trillion, to be consistent with BEA numbers (explained later). #2 There are some 151,012,000 people working for a living including ALL categories (the BLS does not count farm, self-employed and the military). This figure is the average for the calendar year 2014. #3 If we assume there are 2,000 hours worked per year per person that equates to 302 billion hours worked per year. This is the only assumption used here and since many workers are part time this maybe an overstated number. Whether it is or not doesn’t matter to the discussion of the concept. It would only matter if implemented. # 4 Therefore, if we divide the $3.2 Trillion spent by the Federal government by the 302 billion hours worked by all the citizens, that gives a ratio of $10.56 of federal spending per hour worked. The idea is based on an economic principle that my advanced econ professor taught me my senior year at Ohio University which is, basically just a form of a thought experiment. The principle is that if we make a change and the result of the change shows a result that is the same as before the change, then there was no real change in the output only a change in how we got there. The assumption then is that it makes no difference which method is used. What follows is for federal spending only, state and local could also be added to this but that is too complex for this brief overview. This does include ALL revenue going to the federal government no matter the reason or program including social security. #1 We eliminate ALL personal federal taxes and fees and ALL business taxes and fees as well which then reduces the governments’ income to zero (all borrowing is also eliminated). #2 Simultaneously we reduce individual pay rates by the exact amount of the taxes they pay. For example if you were making $25.00 per hour but only taking home $20.00 per hour the change we make would be that you would now be making $20.00 per hour but paying no taxes so your take home would be the same as before $20.00 per hour (no change). #3 Businesses would be required to reduce prices such that their income would be unchanged in a similar manner. So the net economic effect on the economy from this change (initially) would be zero since private and corporate spending would be exactly the same (no change). #4 To compensate for this loss of revenue the federal government would be allowed to create fiat money (no real change from what they do now) at the rate of $10.56 per hour worked by the citizens. And since there would still be 302 billion hours worked by the citizens (no change) they could spend $3.2 trillion dollars (no change). $5 The result is that there is still the exact same amount of money in the economy in both the current system and the new system. All we did is change the method of how it got from the worker to the government. You can see we have made major changes but nothing has really changed, we just changed the method of how we got from there to here. So therefore we are in accordance with the economic principle we started this section with being true. I think you can see the benefits to this kind of system and, of course the devil is always in the details; however I believe I have considered most of them and they are not major obstacles. I do agree that this would take a lot of re-education to the public but I think it could be sold especially after 2017. #1 The federal government can only spend more money when there are more people working more hours. That is an incentive to promote growth not dependency. #2 No one has to worry about paying federal taxes so all purchasing and investment decisions are based on economics not tax avoidance. This makes for a much more efficient economy. #3 The federal budget is always in balance. No need to borrow money and this also forces international trade to be in balance since the government doesn’t need to borrow from foreigners. #4 Lower prices for products produced here would make the US more competitive and since the take home income is the same internal growth would be immediate. #5 We end up with a labor based currency which is a improvement over what we have which is debt based. It also takes gold out of the equation except possibly for international trade since the current system we have of pegged rates does not work. However, that is a different subject for other papers. #6 There are no downsides other than some federal agencies would no longer be required, such as the IRS and the FED. So actually the federal government would need less money. The equations shown after this discussion are used in national income accounting to calculate Gross National Product (GDP). To show how this works we present an example using the real numbers for 2014. Again this is a simple macro model and the details are much more complicated then what is shown here. However, that doesn’t matter since the principle is valid and all the details can be worked out. Note the BEA does not count borrowed money and transfer payments are not shown as growth. The BEA’s G also includes state and local spending much of which is transfer payments from the federal government. This means that the BEA figures for “government” used to calculate the GDP are not the same as shown by the United States Treasury for federal spending and borrowing. We will use the BEA figure of $3.2 Trillion instead of the actual $3.9 trillion pulled from the economy by the federal government for 2014 in this exercise. Obviously nothing has changed since in either the old method or the new method The GDP = $17.7 trillion. Properly packaged, presented and sold by someone would solve many of our problems and doesn’t hurt either conservative or liberal principles. Federal Spending is very different from what is generally shown or known, for example: The Monthly Treasury Report for 2014 (adjusted to a calendar year) Shows the Federal Government spent $3.585 Trillion dollars derived from $3.096 Trillion from taxes and fees and $667 billion from borrowing. However the National Debt during the same period went up by $789 Billion so there was additional cash needed for changes in payables and obligations and capital projects of $122 Billion. Therefore the federal government actually spent/used $3.885 Trillion in 2014 or 21.95% of the GDP. Also as previously mentioned transfer payments to the states and cities i.e. block grants do not show as being Federal spending in GDP analysis. That is unfortunate since the federal government has strings attached which give them control of the money and that will get much worse after 2016 when the full force of the Affordable Health Care Act goes into effect. The purpose of the quick review of my idea is to show that economically and monetarily this system works. It works because economics is about people and what motivates them. In one sense Karl Marx was right labor is the ultimate source of value, he was wrong in how to use that principle and that wrongness has lead to much suffering in the world as we tried to absorb his idealist thoughts (socialism) into the real world. This proposed system is a method of merging both Adam Smith and Karl Marx while rejecting John Maynard Keynes completely. Much to the surprise of the EU and the rest of the world, apparently, the Greek rejection of the EU’s current refinancing terms was a shock. As the post is being writing the No’s are over 60% which all but assures the no vote when all the ballots are counted. This level of dissatisfaction was not expected and leaves Brussels with major problems. As I see it there are only six options. Number one is the EU central bank (the ECB) acquires all the Greek debt in the private sector at a discount level that leaves them all solvent. This would delay the real issues but still precipitate a market collapse on Monday unless they don’t open the exchanges. Number two is the American Central bank (the FED) acquires all the Greek debt in the private sector at a discount level that leaves them all solvent. This would delay the real issues but avoid a market collapse on Monday and we’d see a drop but probably not a major one. Number three Greek government could nullify the election and either argue for better terms or agree to the existing terms of the EU. This would delay the real issues but avoid a market collapse on Monday and we’d see a drop but probably not a major one. Number five the EU could consider this a rebellion and send in a military contingent to throw out the government and install an occupation government. This would also trigger a market collapse unless the exchanges are closed Monday. Number six another country could buy the Greek debt held by the EU. This could be Russia China India or the US. This might also mean the need for an occupying force but might not. The market would go down but not as far as either of the other options. As can be seen for these options there are no good ones for the EU or Greece.— we will know in a few hours what will happen. Based on the BLS July 3, 2014 Release USDL-14-1243 we have the following analysis using the numbers shown in Table B-1 and A-8. Then we use a DOD monthly report for Active duty military to add to the other two of 1.36 million soldiers. By doing this we get a more complete picture of those that are getting pay for some form of work and are therefore not on public assistance or retired. For reference that report claims that 288,000 jobs were created in June. The first thing that came out when we look at what has happened since the high point of the previous growth period in October 2007 was that we are still short 394,630 jobs from then making this the slowest recovery on record. But there were categories of gains and categories of loss’s so what are they? 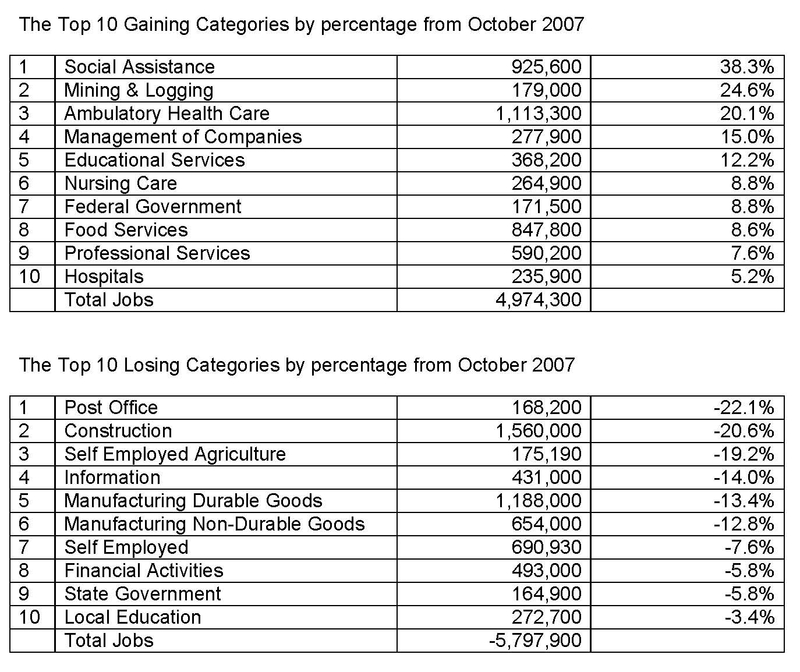 The total gains and losses for all the other categories give a net gain of 428,990 which when combined with the two table’s leaves us with a net loss of jobs since October 2007 of -394,630. But we also see that close to half of the gaining categories are low paying jobs and that most all the losing categories were good paying jobs. It would therefore appear that not only are there fewer jobs but there has been a shift out of traditional middle class jobs to lower paying personal service jobs in food service nursing homes and the like. Without seeing the income distributions that is speculation but the categories speak for themselves. The only real winners in the past 7 years appear to be the upper middle class and the upper class as those categories of government workers, financial advisers, legal and doctors have increased. The Great Recession actually started in November 2007 as that was the month that jobs in the US started to decline from their peak in the previous month October. The collapse in the financial markets started 12 months later in October 2008 just prior to the presidential election. This analysis is intended to show what was in place at the peak October 2007 compared to today May 2014. In this analysis we will use only official government data; however it will be adjusted to reflect TOTAL Employment not just what the Bureau of Labor Statistics (BLS) shows each month with their employment status report. They don’t report the farmers, the self-employed and the military; although those numbers are available, so we just add them to the BLS numbers to get a truer picture of “all” the people earning a living. Next we add in the jobs the BLS doesn’t count. The difference between the two periods is, by the BLS numbers, that we now have 100,900 more jobs than October 2007 which is good; however if we add back in the agriculture, self-employed and the military we are still short 809,440 jobs. This means there are 809,440 fewer people without a paycheck today than in November 2007. Also note that there are more people in the government than in the goods producing sectors in 2007 and and a lot more in 2014, that just doesn’t seem right. So the bottom line is fewer people working and those that are working are bring home less money. The shift of a large portion of the manufacturing sector to China and India over the past dozen years has decimated the American middle class and swelled the rolls of those dependent of the federal government for various forms of transfer payments from food stamps to disability payments. NO ECONOMIC OR POLITICAL SYSTEM CAN SUSTAIN THIS TRANSFORMATION BEING IMPOSED ON THE CITIZENS FROM THE PROGRESSIVE POLITICAL WINGS OF BOTH MAJOR PARTIES. THINGS WILL EITHER CHANGE OR THE AMERICAN SYSTEM WILL COLLAPSE. This was written in 2008. Until only a few decades ago economic development in the sense that it is viewed today did not exist. New developments happened by personal salesmanship and hard work. Everything changed after the federally funded “Manhattan project” showed what directed research could do. Then shortly thereafter when Silicon Valley was created in California as a result of mostly federally directed research for computational power for the military and space markets precedence was set. Now every city in the country would like to have a success like that in their town but how? The focus over the past several decades has been on entrepreneurs and venture capital with emphases on the venture capital thinking that that was the key, to have seed, angel and traditional venture money available. That approach only partially works for the funds managers looking for a return, which they must, go where the perceived opportunities are which is not necessarily where the “local” community is. The local community is being defined here as where the fund is located. But actually, if you think about it, the focus on money and trying to find the next hot deal is an exact backwards approach for a region or city. The key is not in making the venture money available for the money will come to the deals that are good. The key is creating a concentration of creative people and entrepreneurs. The logic here is that no one knows what the next hot deal will be but the entrepreneur that has it. In fact, no one foresaw the benefit to any of the major development trends until after they happened. Further there is no way to know which entrepreneur will be successful and when they will first get an idea that’s good. Therefore for any locality, such as Cleveland, that wants to create growth the most cost efficient method to get real economic development would be to attract a large numbers of entrepreneurs. For if enough of them could be concentrated in a location their very numbers would almost guarantee a big hit at some point in time. This is a shotgun approach and when there is no hard target in sight a shotgun is better than a rifle. To bring entrepreneurs to a location in the numbers required to guarantee a major hit would mean a number of thing are required and money is not one of them. Money is the most mobile of the requirements for success and will come to the ideas. What is needed is to focus on the innovation process and set up a process to facilitate all the steps. There areas can easily be identified and there are a place to live, a place to invent and a place to get help. Create an economic empowerment zone by tearing down the worst ward in any inner city and build a village of middle class homes at say $150,000 each for the home. Say 500 to 1,000 homes so we would need maybe $250,000,000 for the project which can be done with bonds. These homes are loaned to anyone who submits a valid business idea to a review committee and they are allowed to live there free for 10 years. They get a reduction in the $150,000 home commitment that they make of $5,000 for every job created in the city. At the end of 10 years or sooner they get brought out. The home is then cleaned up and given to the next entrepreneur. There is a lot more to this but we’ll skip for brevity. Most inventors are hampered by a lack of resources. So the next step is to create a place they can go were all the tools for making and doing things exist. Let’s call it a craft center for lack of a better term. A place that has research facilities, a small machine shop a computer lab with appropriate software and all the other things that you might need to develop or build something. Ideally this craft center would be in the center of the entrepreneur’s village. That keeps travel time to a minimum which facilitates that innovation. Like in the previous discussion there is a lot that goes with this but those are only details. An educated guess would be $50,000,000 to build the center again well within the reach of local bonds. The third thing needed is knowledge and education; so how about a 2 year, a 4 year and a master’s degree in entrepreneurship for the curriculum in a special school or college within a university. In each case the requirement for graduation would be a business plan. What would be taught would be how to find markets how to manage and how to plan. A combination of a business and technology program so to speak. But since some of the areas where growth could be expected are very technical and science oriented some method of traditional education would be also be required. Combining an engineering degree with the entrepreneur’s school so all the non engineering courses required for a traditional engineering degree would be supplied by the entrepreneur’s courses. Student loans could be given out with the entrepreneur either paying in cash, as normal, or given a credit of $5,000 for each job created. Again many details but we’ll skip those for now. Hard to estimate the costs but lets say a thousand students so it would probably be under $100,000,000 to put 1,000 students through 4 years. If those 1,000 students each created only 25 to 35 jobs, on average, that is 30,000 jobs per year after the first 4 years of the program. Every location in the country, or the world for that matter would like to foster economic development within its geographic area of responsibility. Governments, States, Counties and Cities have all set up programs to try and find a way to promote economic growth, especially technology based growth with all kinds of “programs,” “grants” and “tax breaks.” Not many of these programs have worked as well as they were hoped to, and in my opinion there are several major reasons why promoting this kind of growth is very difficult. These are: one, true “New Ideas” typically don’t come from organizations they come from unknown inventors or entrepreneurs; two, these inventors (word used to mean both inventor and entrepreneur) normally don’t have “experience” or “money;” three, many of the traditional methods of help result in the inventors losing most of the value of what they came up with; four, because of politics with the use of “public money” most of these programs end up being very conservative; five, even with these programs there is no one source shop to go to. Many, if not most, of the core issues for the inventor center on finding money for doing the designs, building prototypes and getting patent protection without losing their idea. Writing business plans and securing seed and/or start up money are also high on the list of needs as well. Getting through these hurtles is extremely hard for most inventors and many good ideas never get made because of this. So is there a way to help these inventors and promote technology based growth. I think there is. At the State or better at the County level within a state a special kind of community could be established with public money that did the following. A. Have a place to live for the entrepreneur and his/her family. This would consist of homes build for the city or county where they were located, preferably located near a major university. In the community would be created an environment that would facilitate inventing. That means as many of the daily needs of the community as possible would be located here. The logic being that you want the inventor to spend as little time as possible doing things that aren’t inventing. B. In the center of this community would be a facility that would contain: a number of good computers and appropriate software (both business and technical), related support equipment like desks, phones, file cabinets, copiers and fax machines, a complete machine shop, a model making shop to include stereo lithography, and an electrical and electronics lab. This listing is only meant to show breath not every aspect. In essence this facility would have everything that an inventor would need to take his or her idea from concept to working model. C. Have a small staff of support people such as technicians, attorneys, engineers, programmers, accountants, business people and machine operators knowledgeable in all aspects of making things. These people would be there for advice and could come from the nearby college and/or from retired business executives. Existing organizations like SCORE would fit in here perfectly. Obviously there would need to be some admin people as well to keep the place running. D. Have the support of local business that had previously agreed to help or mentor those using the facility. E. Have ongoing contacts with the seed and venture capital community and even hold investment conferences during the year where inventors could present their case or ideas to interested parties. In other words this would be a comprehensive facility where and inventor could get access to design and make almost anything be it hardware or software in nature. And it would be a place that took no ownership in the idea its sole purpose would be to facilitate the inventor and give him or her a place to work. To gain access to this facility an inventor would need to write up his/her idea and submit it to a review committee. The main purpose of the review would be to make sure the idea was within the scope of the facility to handle and that it had some economic potential if it could be produced. This would not have to be a formal presentation and its purpose would not be not to judge whether the idea would work or whether the inventor had the ability to make it. The secondary purpose would be to see if the inventor had the will to make things happen. Based on a positive review of the idea presented the inventor would be allowed to use the assets of the facility to design and build their idea. However this is not an open ended deal and part of the review would be to tell the inventor for how long they had the use of the facility. It is assumed some form of scheduling would be required and the facility should be open 24/7 to accommodate people that are holding jobs. They would have to do the work and the “state” would provide the tools to do so. The inventor would not be given any money only the means to design and build their idea. The technical and business staff would be there for guidance and support but not for doing the work. However if the inventor needed help in an area and wanted to pay for help it could be provided at minimal cost to them. To an inventor buying all the equipment needed to build something would be cost prohibited and to try and find a range of local companies that would even do it for them would be very hard as most companies are looking for production work not one or a kind projects with unestablished companies or inventors where they may not get paid for what they did. To the state buying all the equipment needed to establish a facility of this kind is not out of the question but finding new ideas are. Public employees are not risk takers and so most publicly funded programs end up being to make small improvements to existing ideas. The state here provides the expensive physical plant and since it is a conservative use of funds the public is not seeing their money being given away. Since local and state money was part of the funds used to build the facility the inventor would agree to start their venture in the immediate locality if at all possible and within the state in any case. That is not too much to ask for the use of the facility and is really the only string attached. Using Cleveland as an example since it has gone from the top to the bottom in less than 80 years we can see what works and what doesn’t work. Cleveland in the last half of the 19th century and the first part of the 20th century was a center of innovation. That innovation created growth. Cleveland in the ’00’s is for all practical purposes brain dead and is now ranked as the second poorest city in the country. If nothing changes than nothing changes and in Cleveland if it doesn’t work the first second or third time just keep trying till it does. Sadly no matter how many times we study the problem and try it has never worked and so we are where we are. We’ve been trying the same formulas for several generations and so the people have figured out that the politicians and community leaders don’t have a clue so they voted with their feet, their gone. Even the PD figured that out in the editorials they have done over the past several years. Much good it did as no one is reading them but then maybe the flaw in the PD work is they assumed Clevelanders can actually read. A solution that has worked well in other areas of the country, where similar but not as bad problems existed, was to combine all the affected communities into one large city. Again the PD has recommended that for Cleveland but I guess we would all rather disappear as a community rather than fix the problem. Too many politicians involved to actually make this possible. For think about it there would be a lot of mayors and council people out of a job if this was enacted. So since that will never happen here this entrepreneur’s village maybe something that could be done. The underlying logic here is to find a way to attract entrepreneurs here not the money as for the jobs it’s the people not the funds that is the key to turning Cleveland or any city around. So, using this White paper as background any of the local colleges could do an economic analysis of this idea to include pro forma economic projects of implementing these recommendations. The study would cost little and given the critical condition of the city what is there to loose? It has been very popular for many intellectuals to adopt the view of Malthus that the planet’s resources are limited and that there are way to many people on the planet. A good portion of the environmental movement is also based on these same views. Unfortunately most of these “intellectuals” and “do gooders” are not knowledgeable in the science and engineering that relate to energy production and development. What we do know is that the generation and control of large amounts of cheap energy is critical to maintaining a high standard of living. We also know that when the need for large families is eliminated that the people will have fewer children. The solution therefore is to raise the standard of living which then results in fewer children being born. How many people the planet will support is unknown for it depends on the technology we have and how much energy we can control. If we assume that the politicians want the citizens to lead happy and productive lives (which is not certain) then we know the only way that can be done is through having cheap and abundant energy available. This is the opposite of the current directions of those in positions of power mostly because they do not have the education, intelligence or the vision to see the real solutions. Most of them operate on a zero sum game where it’s all about the distribution of the pie not the making the pie bigger. What we do know is that if zealots are left unchecked and the environmentalists are zealots then they will destroy civilization. For example, the banning of the incandescent light bulb in the United States starting with 100 watt incandescent lamps in January of 2012. The replacement lamps for now appear to be mostly compact florescent lamps (CFL) which produce more light per watt of electricity. LED lamps are the same with slightly different numbers. This is being done for only one reason and that is to use less energy. But is what is being said about less energy a true fact, well let’s find out. A 100 watt incandescent lamp will produce when turned on 90 watts of heat and 10 watts of light. A 100 watt CFL replacement lamp will produce when turned on 50 watts of heat and 50 watts of light. These numbers are not the actual numbers but they are reasonable estimates used for discussion purposes. So we can say that for every five incandescent lamps we only need one CFL lamp. So lets say we have 10 incandescent lamps and we replace them with 2 CFL’s that reduces the electric load from 1,000 watts (10 x 100) to 200 watts (2 X 100) and we save money. Maybe, maybe not those 10 100 watt lamps that we replaced were helping to heat your home in the winter. When they were replaced by the 2 100 watt CFL’s we removed 800 watts of heat which is where all the energy that the incandescent lamps used went. They are hot to touch remember. The difference between the two types 800 watts will need to be made up for by the furnace in the winter so depending on the rate one pays for power you could be spending more for the heating then you were saving from the electricity. In general the addition cost of heating in the North could be higher then the savings if air conditioning is not used. And in some cases the higher cost of the lamps even with the offsetting longer life and with air could make this a bad investment. In the south with little heating the CFL’s would save money especially with the reduced air conditioning load. The point to this is that the savings will not be as advertised. And if it isn’t did it really make sense to shift 100% of lighting manufacturing to China along with all the jobs. National policy should be determined through independent private sector research and development, and outside the political system to include funding. If Governmental is involved it should be used only to recommend general policy and never to actually provide any services. There is a current movement of social change that has been put into play by those politicians wishing to make changes that will give them more power. There is no other way to say this for it is and has always been that those that rule are never happy with some power they always want more. Machiavelli’s the Prince is probably the best book on that subject ever written. This need for absolute power is not related to left or right political views both of these artificial categorizations want the same things each for themselves and only with a different twist. This has always been the case since recorded history begins and from that we can assume before that to the beginning of mans rain on earth. This drive for power and wealth is a fundamental aspect of our very nature and it can result in both good and bad if not properly channeled. The problem arises when we allow those with the desire for power to manipulate the education system and change the way our children are taught. This is easy to do if the Citizens are not vigilant and we have been asleep for a half century now. Political Correctness (PC), Multiculturalism, Class Warfare and the cradle to grave welfare state are the tools that are being used and they have erased from our history the knowledge of all that allows us to be free, which is knowledge. The promise that was instilled in the young was that with just a little more government and less private sector that all the people would be better off and have more. We just need the government to make things fairer by asking those with more to share what they had with the rest of us. What could possibly be wrong with that? Much of what is being put in place in America now is being allowed because of the way the last two or three generation we taught. Few today much young than 50 would not be able to have even a basic discussion on limited government and big government and on central planning and free markets. This post is not and cannot be an economics text but never-the-less the basics must be understood if we are to discus government so based on the excellent book written my Mark Skousen The Big three in Economics Adam Smith, Karl Marx and John Maynard Keynes we will quickly introduce the reader to those three plus one others who has had a big impact on the way we view our world. The second period is one where questions arise over Smith’s writings that result in the basic principles being questioned. Smith did not develop equations and formulas his work was one of logical development based on empirical evidence. Since this was the period of rapid industrialization in Europe and America there were dislocations that were occurring that appeared to disprove what Smith had developed in his work. The third period was that of Karl Marx and his view that all production belonged to Labor and that land and capital should be placed in the collective for all to use. Marx believed that the workers were being oppressed and that a new system would be developed based on the principles of Hegel’s Dialectic where a thesis caused an antithesis to develop and that lead to a synthesis (a new order). Marx’s view was that his Communism was the new order. The fourth period was where Smith’s views were proved correct by many others when mathematics resolved some of the problems that had developed in Smith’s principles which until now were verbal descriptions not mathematical formulations. This period ended in the thirties with the great depression. The Fifth period was dominated by Keynes and his theories of deficit spending, no or minimal private savings and government intervention in the market place. Keynes developed his theories in response to the great depression that was causing much hardship in Europe and America except for Germany and Russia which had turned to a powerful central government albeit for different reasons. This economic growth under a strong government gave credibility to Keynes views. The Sixth period is that which we are now enduring. Additional work especially by Milton Freidman shows that Keynes was not correct in his views — his work was distorted by the events of those times when he lived which lead him to make assumption that have now proved to be false. Then there was the fall of the communist states and/or their embracing free market principles in portions of their economies has proved that Marx was wrong as well. So with both Marx and Keynes both disproved Smith’s views of a free market and laissez-faire were now proved to be true once more. Skousen’s book was published in 2007 before the housing bubble burst and we elected a very socialist President in 2008. Those in Washington today believe in Keynes or at least in his big government e.g. like in China. This view is false as over the past several decades congress has passed legislation here in the United States to the point that our market was free neither in its conduct nor in interference from the federal government. We therefore find ourselves once again in a period where the politicians that have wrecked the economy are telling us that they need more power to fix the problems. Since they are the very ones that created the problems this transference of power to them must be avoided at all costs. Unfortunately, Economics is a complex subject and the politicians depend on that to keep the public misinformed. Six books that go a long way to showing where the problems lie are now listed. But keep in mind that a full study of the issue would take much more then just these few books. A Monetary History of the United States, 1867 – 1960 by Milton Friedman and Anna Jacobson Schwartz published in 1963. One section in the monumental book shows how the newly created FED caused the Great Depression. Free to Choose, Milton & Rose Friedman first published in 1979. Milton and Rose Show how the welfare state cannot exist in the long run, indirectly it explains the collapse of the old Russian U.S.S.R. ten years after the book was published. The Five Thousand Year Leap, by W. Cleon Skousen first published in 198, an excellent book on political philosophy written for those without a degree in this subject showing how things are not what we may think they are.. The Ruling Class, By Angelo M. Codevilla published in 2010, excellent contemporary book explaining the current push in American to set up a Ruling Class. Reckless Endangerment by Gretchen Morgenson and Joshua Rosner published in 2011, Very well document analysis of the 2008 house bubble collapse and what caused it — and it was not the banks it was the US Congress aided and abetted by the FED. Extortion, by Peter Schweizer published in 2013, an absolutely devastating description of the rampant corruption in the US Government. The founding fathers are turning over in their graves right now and I would not be surprised to see them come back to get rid of the entire crop of obscenity that now resides in Washing DC. There are a few other books that would help the argument but they get technically complicated and so the last two are enough I think. The line of though developed here is that we started with a Constitutional Republic without universal suffrage and the purpose of that was to place “strong” limits on the federal government. Those limits we needed because of the failing of human nature and that if they were not here a ruling class with arise and the republic would be gone. This is done by legislation which gives us a large bureaucracy with has the power to write regulations, create rules, make fines for non compliance and set up permits for almost everything. All this is done for our benefit of course but every one of those things takes away a bit of our personal freedom and at some point, not far off now, the freedom is all gone. Free Market or Central Planning? The justification for having or for creating a ‘ruling’ class be it secular (wealth) or an aristocracy (heredity), as it has been historically called is that this class of people are very intelligent (the best families) and well educated (only the best schools) so they should, by their very nature, be given the right to make the economic and political decisions for us. They can do this because besides those qualifications they have the time and inclination since they come from wealthy families and have no need to work for pay like the rest of us do. Aristotle, Socrates and Plato wrote about how to get these people the proper education and motivation so they would become good rulers; and much of political philosophy ever since has been devoted to this concept. So we are lead to believe under these assumptions, proper education and motivation, that this group of people will do what is good for the country and the Citizens even if it is not in their best interest. This is what is really believed, believe it or not. That last part, in particular, is a bit much to believe as everyone always does what is in their own best interest but for now we’ll ignore that part and go to the heart of the argument which is that its their intelligence and education that make them so qualified to legislate and run the country. Because we have the Constitution and there is technically no ruling class they, those that lust for power, are handicapped and they will try to establish themselves here by other means. Those are though legislation and regulations that will be enacted to control business to prevent those businesses from doing things that would not be good for the Citizens. On the surface this sounds reasonable however the reality is that is will give them the control of those businesses and allow those in power to accumulate wealth as written about in Peter Schweizer’s 2013 book Extortion..
Well let’s look at this and see if it makes any sense that a select group of people could run the country better then the Citizens could. There are 435 Representatives in the House of Representatives and there are 100 Senators in the Senate for a total of 535 elected representatives. Then we have the President and the Vice President and his appointed Cabinet of advisors numbering 15 for a total of 17. Lastly we have the 9 U.S. Supreme Court justices. Granted that these are not all elected positions but they can logically be said to be the ‘head’ of the Federal Government and the group that sets the policy of the country. This group totals 561 people. We could add the Obama administration appointed Czars and their staff’s here if we knew who they all were, but we don’t so we’ll skip them in this analysis. Now each in that group has a core around them let’s say a couple of dozen key staffers so 561 times 24 equals 13,464 people that are the ones running the country, could be a bit more could be a bit less but it’s a reasonable guess. It is this group of super intelligent and well educated people that we are told should be running the country. Today under this administration this group is comprised of mostly by progressives and they believe they will be able to make all the decisions for us and thereby we will all be better off. For reference we will say this group of leaders has an average IQ of 150. Now there does seem to be some logic here for we do want the best and the brightest right, but is the logic valid? The country today, that this group of 13,464 is to manage, is in round numbers almost 320,000,000 citizens. But some of those are children and some are retired and in nursing homes so their economic activity is limited. Let’s say that 68% of the population is economically active so that gives us ~217,000,000 citizens and they will have by definition an average IQ of 100. Now we have the basis for the rulers and the number of subjects to be ruled. Let’s make this into a computer problem of solving an economic problem. We can define that problem as how fast can we analyze a block of data, in this case the GDP of the country which is just under $16.0 trillion dollars (2009 dollars) today, 2013. We can then say that we need to process 16.0 trillion bits of information to give us a result. But let’s break it down into a more reasonable number by dividing it by the number of days in a year, 365.25 days; to give us how much must be processed each day. And that would be $43.8 Billion bits of information per day that represent everything we do each day (actually the number is much greater but will use this for sake of discussion). So now we have our problem which can be thought of as analyzing a distributed network of multiple computers and how fast can they solve a problem. So we take our elite group of 13,464 top government officials and say they are 13,464 CPU’s running at 150 Hz (150 times a second) Then we take our 217,000,000 Citizens and say they are 217 million CPU’s running at 100 Hz (100 times a second). The question is can the 13,464 CPU’s at 150 Hz process 43,800,000,000 bits of data faster then 217,000,000 CPU’s running at 100 Hz. But let’s be fair and say that this elite group because of their education is faster by a factor of two. That then gives us the government on the one end with the ability to process 43,800,000,000 data points divided by 4,039,200 (13,464 times 2 times 150 = 4,039,200) which is 10,844 seconds or 3.0 hours. Not bad! On the other end we have the Citizens with the ability to process 43,800,000,000 data points divided by 21,700,000,000 (217,000,000 times 1 times 100 = 21,700,000,000) which is only 2.0 seconds which is 5,364 times faster and therefore is significantly better the first group. Clearly the Citizens are significantly faster and therefore better at processing economics data. Further the Citizens at their level are the ones directly involved in the transactions unlike the government which is removed from the actual transactions by several orders of magnitude. That means that there are significant time delays and processing errors that can not be avoided so the government is working with “faulty” information and working on a solution to a problem that existed sometime in the “past.” There is no way for this not to be true. The planners find that the result of the previous plan was not what they expected so they make an adjustment in the new plan to correct, in the future, for something that was thought to have happened in the past. To know why something didn’t happen as planed when there are hundreds of millions of transaction is not easy, actually it’s impossible. For example lets say thin the master plan there was one place that called for 25,000 items X (they are small) to be made and shipped from location A to location B. When the plan was implemented the truck on the way from A to B had an accident and they were all lost. The planer sees months later that the output of B was not what was planned so he increases the quantity of X from 25,000 to 50,000 in the next cycle to make up for the loss. This time they all get there but the plan for B still only calls for a need of 25,000 X and so they just put the difference in stock. In engineering terms this is a positive feedback where the result of the action is that things get progressive worse. In a free market system the market place gives both positive and negative feedback. The positive feed back increases the output and gets the planer a raise. The negative feedback allows the planer to find out what is really wrong and fix it or he loses his job when the firm closes down. In the United States over the past 20 years there was feedback on job loss going on in the economy as production left the country for China and India. The problem was the high cost of doing business here and it was not all labor. Washington elected officials ignored that and continued to pass laws that were not beneficial to business which resulted in positive feedback and the process accelerated. The politicians did nothing because of all the money that was coming in to buy T-Bills which then gave them more play money to feed the Citizens that were loosing their jobs. Back to the example, the planer keeps having A make 50,000 of X to get 25,000 of product at B until B is so full of X that they start giving away or throwing them out, absurd you say that would never happen. Well this simple example combined with the lack of motivation of the workers in the old U.S.S.R. is exactly what led to their collapse. Further, since in collective systems all jobs are political jobs, there is no incentive to work efficiently. Therefore there is a misallocation of resources inherent in this systems (meaning it can’t be removed) that makes these economies very un-competitive. The only thing that kept the U.S.S.R. going as long at as it did was the motivation of a few of their motivated Citizens that worked hard because they knew it was right (to work). It is clearly impossible for Central Planning run by a Ruling Class (which is what this is all about) to work better then a free market system with de centralized planning. Further central planning will always make things worse not better since everything is a plan done by legislation and in most cases no one even knows what the plan is. An actual case can be shown that some of us a bit older may remember. In 1972 David Halberstam published a book titled The Best and The Brightest which was an account of how we got into the Vietnam War. Halberstam blamed it on the intellectuals and academics (The Best and the Brightest) in the Kennedy administration and after the assassination of Kennedy by the Johnson administration which kept them on. The book is a very interesting read and anyone who has read it would be horrified that anyone would think the government could do anything right. de Tocqueville in his writing thought that it might be possible for an American Aristocracy or ruling class to form out of the formation of large businesses. His thinking was that the owners of the businesses would be like the old land owners and they tenant farmers. In this case the business owners would own the means of production instead of the land and the workers would have no place to go except to the factories to work. Just like the tenant farmers that couldn’t leave, where were they going to go except to a different land owner? de Tocqueville was not the only one to see this as Karl Marx certainly had this view and he wrote his Communist Manifesto only 8 years after Tocqueville finished his Volume II of Democracy in America. It would be hard to believe that Marx’s did not read Tocqueville’s work since they were both in Paris from 1843 to 1845.